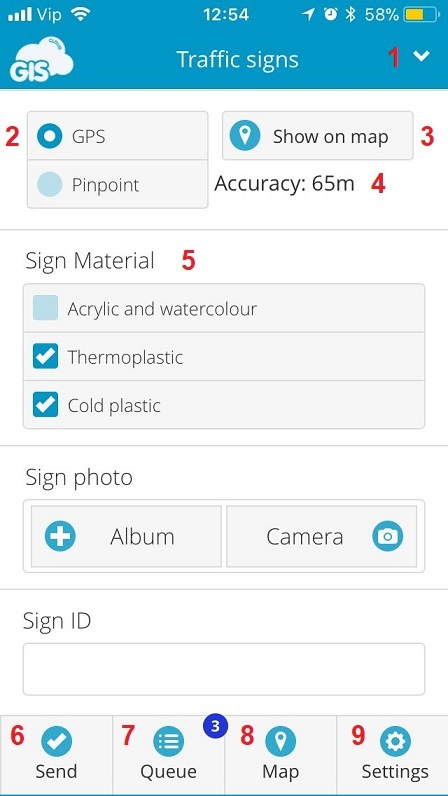 After defining MDC settings, tap on the Form button and start collecting data. Populate fields with data and tap Send button. Collected data will be visible in the Mobile Data Collection Portal and Map Editor. 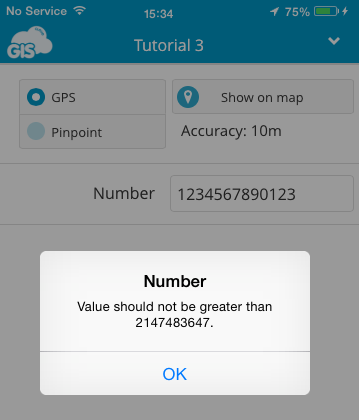 GPS/Pinpoint – locate the mobile device using GPS or Pinpoint. Note: location accuracy will depend on GPS precision on the mobile device and on satellite availability. To define location more accurately, use the Pinpoint tool. Show on the map – show the current location of the user on the map. Accuracy indicator – shows the precision of GPS location. Form – populate the fields with data. 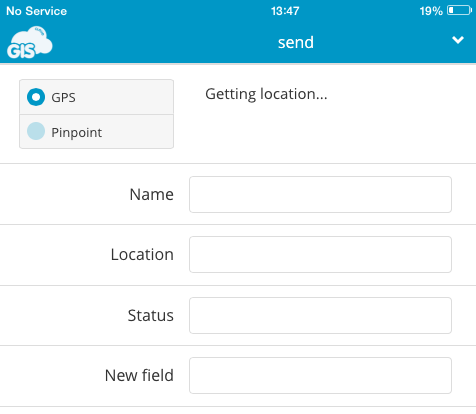 Send – send the data to your map or project. Queue – pending data before it is sent to the map or project. Note: if you delete data from the queue, it will not be sent and the data will be lost! Map – review your project or map on the field. Settings – general MDC settings. Here is a list of the most common MDC errors, messages, and instructions on how to resolve them. A text or symbol is inserted in the Number box. Change value to a number to enable sending. Number 2147483647 is a maximum value that can be inserted in Integer field. Add a value that is less than this value or if you need to add number greater than this value (e.g. 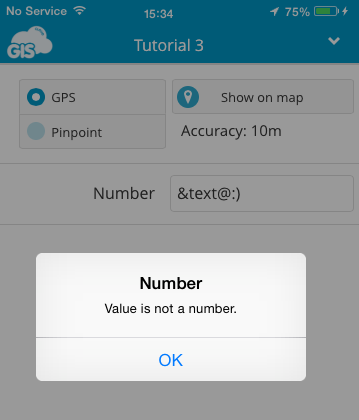 telephone number), add Text field instead Number field in Mobile Data Collection Portal or Map Editor. This message indicates that the mobile device is trying to reach GPS signal. If this message persists, check if GPS is enabled on the mobile device and is there GPS signal available. This message indicates when was the last time the location information was updated. 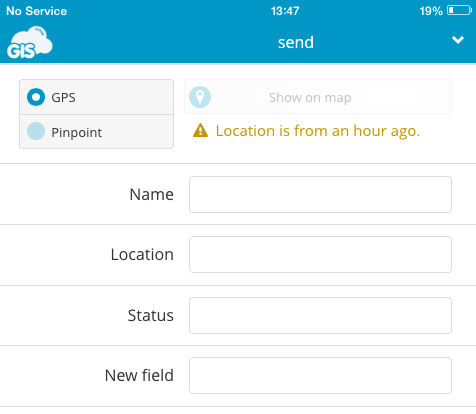 Update the location using GPS or Pinpoint to avoid sending incorrect data. This indicates that device is not connected to the Internet so it is not possible to log out, switch between projects and access the map. Connect the mobile device to the Internet and try again. This message indicates that a point is in the process of sending. If the point disappears from the Queue, that means that it is successfully sent. You do not have permission to send this item. This message indicates that user is not allowed to collect and/or update data. 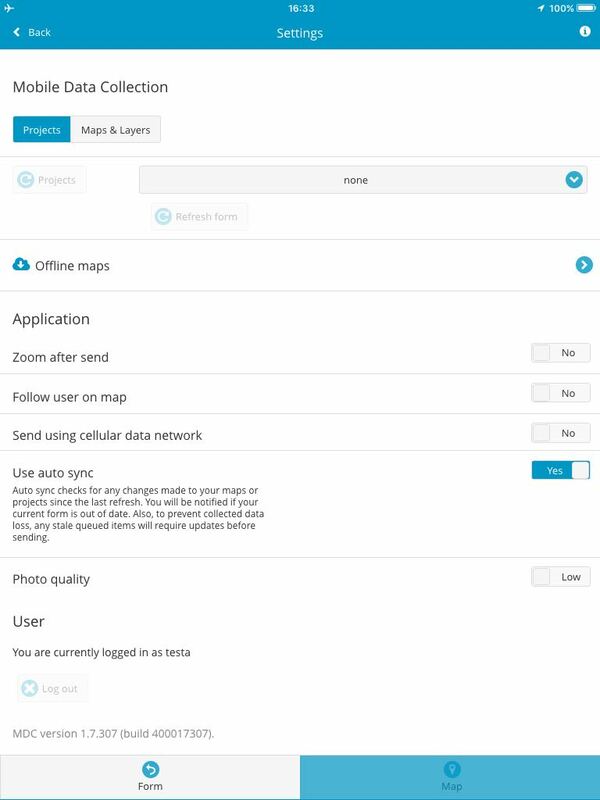 MDC permissions can be granted in Map Editor or Mobile Data Collection Portal. Please note that to grant MDC permissions (Update and Collect) owner of the project has to have assigned MDC licenses. Here is more info about MDC permissions and assigning licenses. The form you are currently working on has been modified and will be updated now. This message indicates that the form structure has been modified and out of date. This feature prevents data loss due collecting data in an outdated form. The form will be updated and it will be possible to continue data collecting. Note that data that is sent in the outdated form will need to be updated in order to prevent data loss. Open Queue, tap the feature, check and update all data and tap Send again. Form has been modified. Tap to EDIT this item before sending. 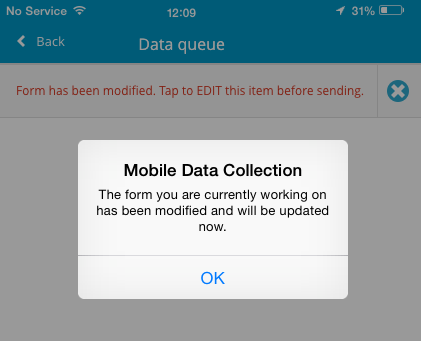 This message indicates that the form is changed in the time between collecting and sending data and it is necessary to update a point before sending. This feature prevents data loss. Open queue, tap the feature, check and update all fields in the form and send the point again. Unable to send. Check value for field ‘name_of_the_field’. This error indicates that decimal number is sent in Integer (Number) form field. Tap feature to remove decimal point and send the point again. If you need to send decimal numbers, create a new Real type attribute in the database. The fields with Real type can store the real numbers, including decimal values. This error indicates that the sent photo no longer exists in the local storage of the mobile device. It has been deleted or removed. Take the photo again and attach it to the point before sending. This message indicates that is not possible to reach data source in which data should be sent. This means that it has been deleted or renamed. Data source of each layer is stored inside Database Manager. If it is deleted, it will not be possible to collect data with MDC in that project. If the data source is renamed, it is necessary to change it to the original name and refresh the project.